Odds are based on statistics. At least that’s what bookmakers want you to think! But bookmakers are interested in balancing out the markets to maximize their profit. To reach that, they adapt the odds based on public opinion. On 7th March 2015, Hamburger SV hosted Borussia Dortmund in German Bundesliga. However the best odds on the market for a Dortmund win were not higher than 1.57 while you got astonishing 4.70 on the draw and 7.50 on the HSV win. The statistical probability for the double chance 1X was higher than 58 % and also the results of the most recent direct match ups supported the opinion that Dortmund would not win. Still the odds for that were awesome as the majority of people placed their bet on a Dortmund victory (the game ended 0:0 by the way). In this formula the most recent matches are more important than older ones as well as matches against opponents that are comparable to the upcoming challenger get a higher value. Then the overall probability of the particular betting option based on both teams performances is set in correlation with the highest odds offered. 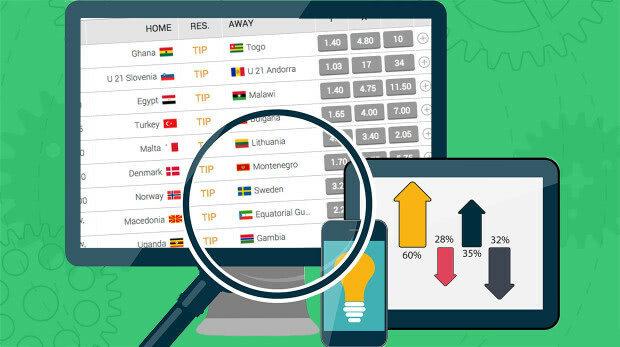 So we are very proud to present you the five bets with the highest value available for each and every game! Please be aware that this will sometimes lead to suggestions that feature underdogs (as they usually have great odds) and we will provide further details on the index after the first test-phase when the final fine-tuning was finished.